This cold February morning found the local rivers and any flotsam of a trashy type still buried under a deep blanket of snow. 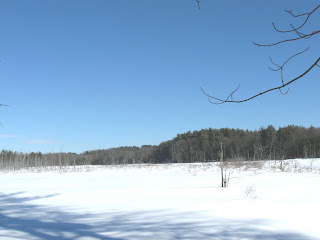 However, while paddling was a no-go, the conditions were ideal for snowshoeing and I returned to the Assabet River National Wildlife Refuge to explore more of the 15 miles of trails there. 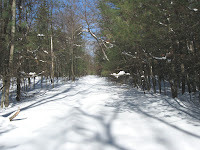 Entering from Hudson Road in Sudbury, I elected to traverse the Tri-Town Trail which had yet to see any human traffic since this week's 2-day snowstorm. The trail is pictured at left. 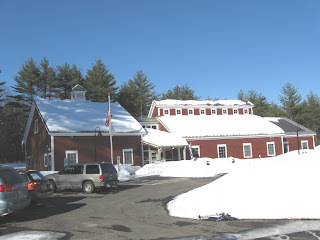 ﻿The Visitor Center opened last October and is well worth a visit. Inside I found friendly and knowledgeable staff ready to provide answers to any questions I had. 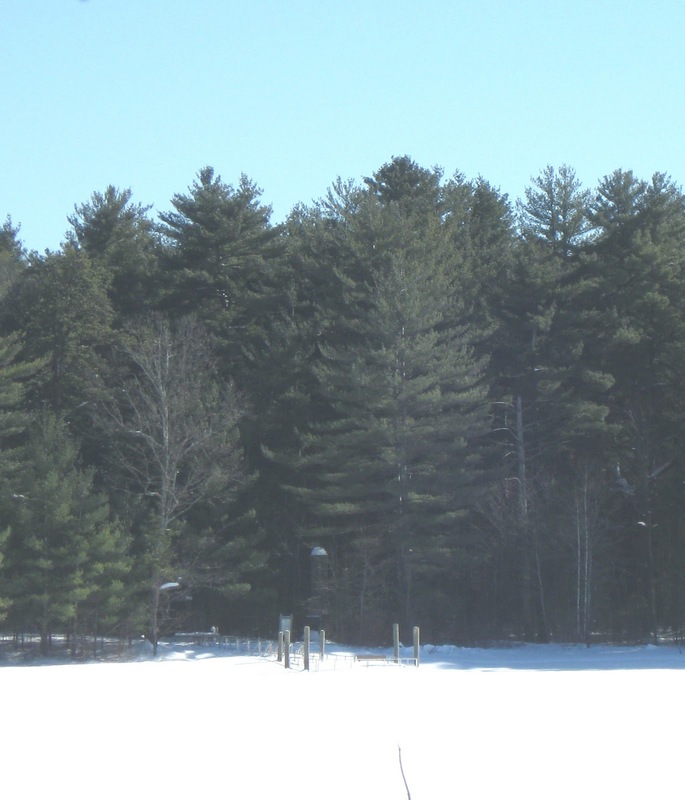 There are exhibits of all the wildlife known to frequent this 2,200 acre refuge. There is also a Nature Store in which I found an expanded second edition of The Central Mass. published by Marker Press in cooperation with the Boston & Maine Railroad Historical Society, Inc. I had thought this book was out of print and therefore purchased one of the copies they had on the shelf. As I mentioned in my last post, this book contains some great pictures and maps regarding the role this facility played during WW II. On the Internet, at a site maintained by the University of New Hampshire, are some historical topo maps that show the area before and after the U.S. Military built the ammunition depot. The before map is at this link. The map showing the facility in 1950 can be found at this link. After clicking to enlarge the maps, look for Puffer Pond. 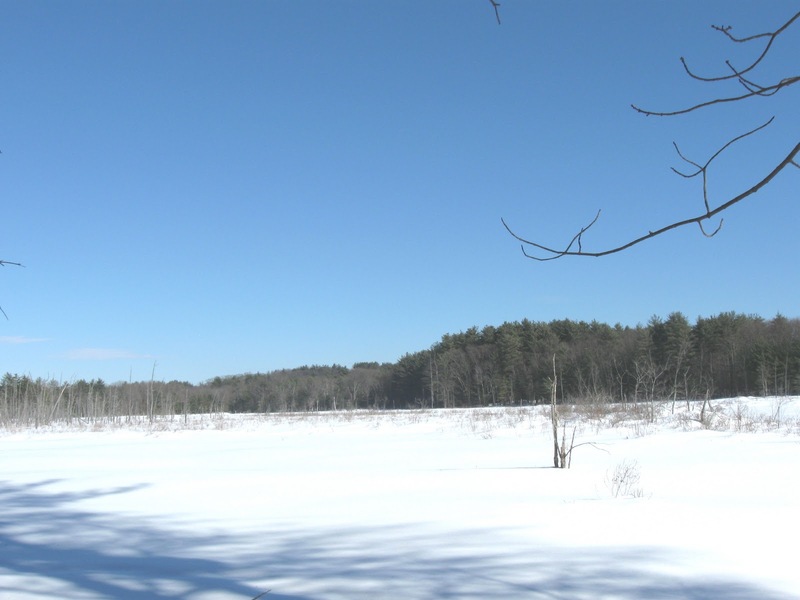 If you're looking for a great location to do some cross-country skiing or snowshoeing the Assabet River National Wildlife Refuge might just be the ticket. And it is free! For more information, visit their web site at this link. I took my class there for a little trip about what they are doing for the Blanding's turtles. I grew up in the next town and we use to look for bullfrogs there until the military police would scoot us out. I agree that the Visitor's Center is great. Looking forward to reading more about your journeys this year.